The scale of Skull Valley’s secret water world is quite evident when viewed from the Stansbury foothills. It’s much less apparent at ground level, where sporadic mirror-like surfaces visible from the highway are often the only hints of its existence. The closure of most recreation roads on the east side of the highway for post-wildfire restoration offers an excellent opportunity to pay this unique ecosystem the attention it deserves. 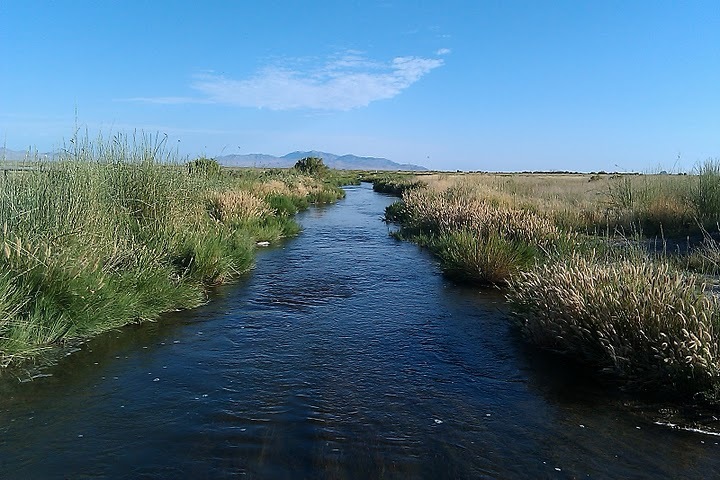 A tributary runs through Skull Valley near Horseshoe Springs. Looking down on Skull Valley from the Stansbury Mountains shows a secret water world in the desert (photo by Clint Thomsen). The following originally appeared in the July 27, 2010 edition of the Tooele Transcript Bulletin. Nothing says “desert” like a mouthful of dust. Or an eyeful or a couple nostrils full, for that matter. You might say I should have known better than to get out of my car so soon after stopping along a dirt road in the dead of summer—that I should have considered the mile-long dust wall that was cresting behind me like a giant breaking ocean wave. I blame the lapse in judgment on curiosity. Curiosity and the genius who posted a road sign typed in an 8-point font. The sun had barely risen above the Stansbury Mountains and Skull Valley was awash with soft light. I was about a mile out on the road that bisects the valley and leads to a place called 8 Mile Spring on the flanks of the Cedar Range. No sooner had I shut my car door than the raging wall of alkaline particulate swallowed me whole. Call it evidence of the desert’s endless ability to overwhelm the senses—a poignant reminder that out here things are rarely as they seem. Take the landscape, for example. At first glance, Skull Valley can appear to be completely desolate. But a closer look reveals an array of natural oases where unorthodox fauna abound. 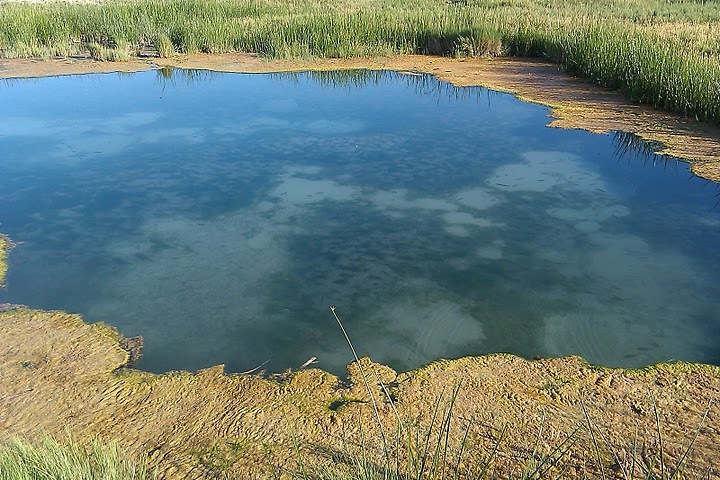 At the heart of Skull Valley’s wetland system is a collection of geothermal springs that issue warm, brackish water. Though understated, these springs are a major component of Skull Valley’s geology. They’re also the source of the valley’s original namesake—Spring Valley. 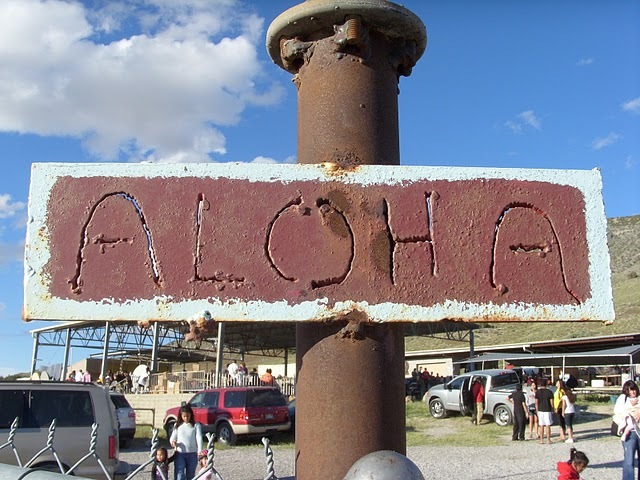 Historians haven’t definitively concluded on the reason for the name change, but it’s possible that “Skull Valley” also derives from the springs. According to legend, Spring Valley became Skull Valley upon the discovery of an inordinate amount of buffalo skulls on the valley floor near the springs. Local historian Don Rosenberg thinks an unusually harsh winter was to blame. Rosenberg theorizes that heavy snows drew herds away from the mountains and down to the springs, whose warm surrounding terrain remains snow-free all year. Once the all the exposed grass around the springs was eaten, the herds had nowhere else to turn and died where they stood. Understanding the science behind these springs can be daunting—especially since no exhaustive study has been conducted on them. Worse yet, geology is yet another facet of real life where my Political Science degree has proven less than useful. Terms like “forced convection” and “Quaternary fault scarps” make me quake in my boots. An unnamed pool near Iosepa. Look past the moss lining the pool-- that's crystal clear brackish heaven in there (photo by Clint Thomsen). Fortunately, the guys at the Utah Geological Survey regularly make painstaking efforts to demystify these concepts for me. UGS geothermal expert Robert Blackett described the recharge/discharge cycle to me as a function of precipitation, gravity and pressure. The process begins in the mountains with rain or snow melt. While much of this precipitation travels down toward the valley in streams, Blackett said a certain percentage percolates into the ground and seeps slowly downward through the bedrock via fractures. When the water hits a geologic dead end, it’s forced back upward and is discharged from the ground as a spring. In the case of thermal springs, water is heated by the earth’s interior as it travels. A thermal spring’s discharge temperature depends on distance traveled and obstacles encountered along the way. Deep-reaching water that rise quickly without mixing with cooler water discharges as a hot spring. The Skull Valley springs are believed to mix with cool ground water before discharging as warm springs. The National Oceanic and Atmospheric Administration (NOAA) defines a warm spring as any spring ranging in temperature between 68 and 122 degrees Fahrenheit. The average temperature of the Skull Valley springs is 70 degrees Fahrenheit—about 8 degrees cooler than the average swimming pool. The temperature and water chemistry differ slightly from spring to spring, but some are probably interconnected and all are brackish from the minerals they’ve picked up along the way. Several support populations of planted fish. According to UGS documents, Skull Valley’s 8 major thermal springs collectively discharge 30,000 to 50,000 acre-feet of water per year. Discharge flows northward and eventually drains into the Great Salt Lake. Blackett said the recharge cycle for thermal springs tends to much longer than that of cool springs. Citing the lack of study of the area as a caveat, Blackett said it’s possible that the warm water discharged from the Skull Valley springs fell as precipitation as far back as the last Ice Age. If you’ve been to Skull Valley, you’ve probably stopped at the twin Horseshoe Springs, which flow together to form a distinctive inverted “U.” I grew up swimming in the deeper north spring. Diving to the source with goggles was always an eerie endeavor, as it very literally is a portal to another world. The Horseshoe Springs were designated a Federal Wildlife Management area in 1990. The pools sustain a small population of carp and largemouth bass. Fishing is permitted, but good luck catching anything. This hole is famous for its belligerent fish. Many an angler wonders if the bass there haven’t simply caught on to our hook-and-bait scam. On my way home that morning, I stopped at Horseshoe Springs to pay regards to the elusive bass. I considered jumping in for old time’s sake, but didn’t. Hearing the gurgle of water against this barren backdrop was satisfying enough. Some of Skull Valley’s springs are visible on the valley floor west of SR-196. Some are located on private property, others on BLM land. Horseshoe Springs is publically accessible year-round. Bug repellent is a must. For more information, contact the BLM at (801) 977-4300. The following originally appeared in the June 24, 2010 edition of the Tooele Transcript Bulletin. Sometimes you just need a trip to the desert. Not just any old desert, mind you, and not just any old time of day. Sometimes you need a need a trip to the mud flats west of Skull Valley’s Lone Rock—at midnight—with a case of Dr. Pepper, a bundle of scrap wood, and a package of bratwurst. That last item is crucial. It’s okay if you forget the Dr. Pepper (although you wouldn’t). It’s even okay if you forget the scrap wood (tumbleweeds burn too). But under no circumstance should you ever forget the bratwurst, because not only is flame-roasted bratwurst delicious—it’s tradition. Serious tradition. The guys and I have made these midnight desert runs since we were in high school. They lasted longer back then, but the formula was the same, and so was the location. We’d spend our nights solving the world’s problems, vowing some day to take over the world. Matt and Brett’s one-liner duels would escalate into a full comedy act. John would leap repeatedly over the fire because he enjoyed leaping over dangerous obstacles and we enjoyed watching him do it. Nowadays we use the spot mostly for special occasions—like when one of us hits a milestone or is looking for some clarity, or just needs a few fireside hours with the guys. Or when one of us has cracked his skull in a recent rock climbing fall and is scheduled for surgery in a few days. If anybody needed a trip to the desert this time, it was Tyler. It had been only a few weeks since that ill-fated night in no-man’s-land, Nevada. Ten minutes into his climb, Tyler went for a quickdraw and slipped, falling backward and slamming his head against the rock. Matt and John were with him that night. They bandaged his head and kept him warm before the rescue crew arrived, then helped carry him down the mountain to the emergency helicopter. It was a night none of them will soon forget. Correction: If anybody needed a trip to the desert this time, it was Matt and John. They hadn’t seen Tyler since that night and the ordeal still haunted them. It didn’t help that after seeing Tyler off and bidding farewell to the rescue crew, they were stranded in the desert with a blown head gasket. There was plenty of time to kill, but not enough to properly process what had happened that night. Chan, Brett and I weren’t present for the drama, but it haunted us too. It was time to confront what John described as a “bad dream with a weird, lingering feeling.” And that meant heading west in the dark of night to laugh and reminisce and stare for hours into a bonfire. As Chan’s scrap wood burned, we rehashed the details of Tyler’s fall and its fortunate aftermath. Were it not for the skull fracture, there would have been no CT scan. Were there no CT scan, doctors would not have noticed the tumor on his kidney. The experience on that mountain was harrowing, but a blessing in disguise. As Tyler saw it, he owes his life to that rock slab. Tyler was in good spirits as our modest scrap wood fire burned low and hot. We laughed about the various patches of hair we had accidently burned off in past fires. We laughed about the canned chicken we had intended to boil over the fire, but that ended up exploding instead. “We were more prepared in those days,” John said. We’ve also come to realize that exploding food wasn’t the most efficient way of preparing it—no matter how fun it was. At some point Tyler began bringing bratwurst, which he’d grill or roast over the fire. It quickly became a staple of these outings. Still somewhat dizzy from his fall, he realized he had one more regret: Not only were they robbed of their campfire that night, they never go to eat their bratwurst. But tonight’s brats were already sizzling on a makeshift grill that John had set up between two planks of firewood. Not having bothered to pack utensils, we used sticks as skewers. It was a simple, grand, cathartic meal. It didn’t take too much convincing. I took out my phone and filmed the jump, then told John I didn’t quite get it so he would jump again. We stood by the fire for a good long time, solving the world’s problems and growing tired enough to seriously consider staying there until morning. Air temperature was dropping. A stiff breeze blew across the flat desert floor and against the dying fire’s still impressive heat, creating a strange, contrasting sensation. As the last columns of smoke rose toward the bowl of stars overhead, we began gathering our scant gear. One more day and Tyler would go under the knife. We were glad we had pulled ourselves away from our beds to make this trip. 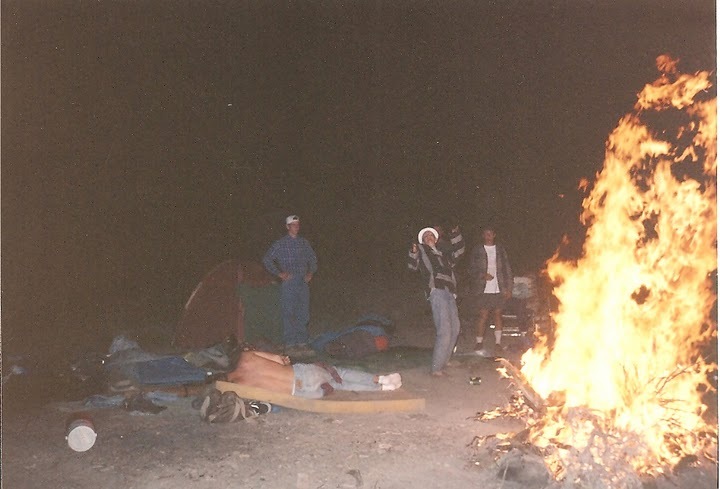 There’s not much a good desert bonfire with the guys won’t cure. And when the need arises again, we’ll be there—scrap wood, Dr. Pepper, and bratwurst in hand. Another Memorial Day weekend has passed, as has another Iosepa celebration. This year’s festival was awesome– good times, good food, perfect weather. You can read the full report in tonight’s Transcript Bulletin. I shot a few photos and video clips with my point-and-shoot and cobbled them together for the montage below. Happy 100th Anniversary, Boy Scouts! IT WAS SUNSET IN SKULL VALLEY. The campfire roared with scrap wood and dried-out tumbleweed, and for me and my fellow Boy Scouts, it couldn’t have been more welcome. It was February. We’d spent the day exploring castle-like rock formations in the western Oquirrhs and I could barely feel my feet beneath me as we staggered back into camp for the evening. Richard and I donned our mountain man capotes and grabbed our camp stools, then extended our frozen feet close to the flames. “Your boots will melt before your feet even get warm,” a calm voice carried over the crackle from a camp chair across the way. It was Stan Ogden, our scoutmaster. And it wasn’t the first time he’d offered us that that particular caution. Stan never scolded. If fact, how he kept his cool with half a dozen rowdy scouts week after week becomes increasingly amazing to me the older I get. Stan was full of wisdom, and he imparted it to us subtly—a joke here, an old scout quote there. He may not have realized that we respected him, but we did. Somebody’s boots melted that night—I don’t remember whose. They weren’t mine. Mine had melted at the Klondike camp the month prior. Richard’s, I think, had melted in Moab. Stan didn’t get two words of his boot melting warning out before we quickly pulled our feet from the fire. I remembered this and many of the things Stan said, explained, and demonstrated. He was a scoutmaster in the truest sense. I became an Eagle Scout thanks, in good part, to Stan’s tutelage. My scouting years are part of why I crave the outdoors, why I love to write about them, why I take my boys adventuring as often as I can. The Boy Scouts of America is 100 years old today, and I’m proud. I’m glad Stan and his faithful assistant, Ron-O, showed us the ropes every week and took us camping every month. I’m glad to be part of the organization today. Scouting is about more than tying knots, swamping canoes, and Dutch oven cooking. It’s about instilling values, building character, and fostering a deep appreciation for American History. It’s about self-sufficiency and level-headedness. Frankly, it’s survival prep for an increasingly screwed-up world. I still see ol’ Stan now and again, and we talk about the old days. It’s very possible, if current positions in our unit hold for a few years, that Stan’s son will be one of my son’s scout leaders. Pretty cool. I wrote a piece about this year’s Klondike Derby camp for the newspaper last week. I’ll post it here tomorrow.